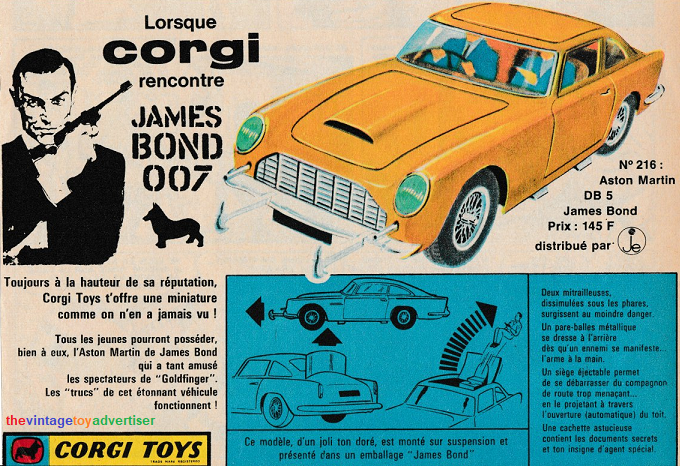 Published April 3, 2019 at 680 × 466 in Corgi Toys – 1960s & 70s French print ads. The screen-innacurate gold coloured first edition version of the famous James Bond Aston Martin DB5. I read that the reason for this strange colour choice was because the only silver paint Corgi had at the time was too similar to the metal casting colour used – leading to suspicions that some customers may believe the car had not been painted at all. Subsequent DB5 models were all painted in the correct silver which Corgi finally managed to make distinct from the base metal.